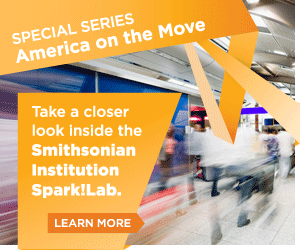 “Livable community” has become the new buzzword in urban planning and transportation circles. 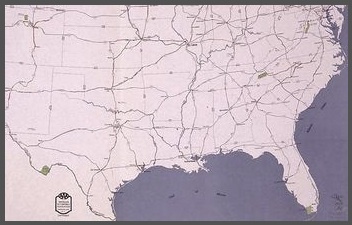 With the U.S. population expected to increase by 100 million over the next 40 years, effective coordination of policies related to housing, transportation, energy and the environment will be necessary to ensure quality of life while expediting the flow of both freight and people in the safest and most cost-effective manner. There are, however, some differing ideas on what defines a “livable community”. The Department of Transportation for the State of Washington, a model livability state, defines a livable future as the balance of three key societal goals: vibrant communities, vital economies and sustainable environments. For all of these goals, sustainable transportation is essential. Asphalt can and should play a fundamental role. • balance environmental goals with economic goals. Now, more than ever, we must seek to achieve the maximum economic impact for our transportation investments and lay the groundwork for long-term economic growth, job creation and prosperity. It is also essential to balance which investments yield the greatest benefits with regard to the economy, the environment and quality of life for all communities, urban, suburban and rural. Asphalt is a good investment for America. Technological advances in asphalt provide cost-effective and green solutions and advance the goals of livability while protecting the investments that this country has made in our infrastructure. 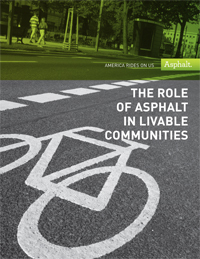 So, what are some of the qualities of livable communities and how does asphalt play a role? Stimulating local economies -- A livable community relies on a healthy local economy and good jobs. The quality of roads and other infrastructure are some of the major considerations that developers use when choosing to do business in a community. In addition, asphalt pavements are built by people who live and work in the areas that they serve. Asphalt jobs are local jobs. Versatility – Asphalt isn’t just for single-driver cars. Buses drive on asphalt. Asphalt is a proven winner for creating track beds that provide a safe base for high speed passenger trains or heavy freight service. 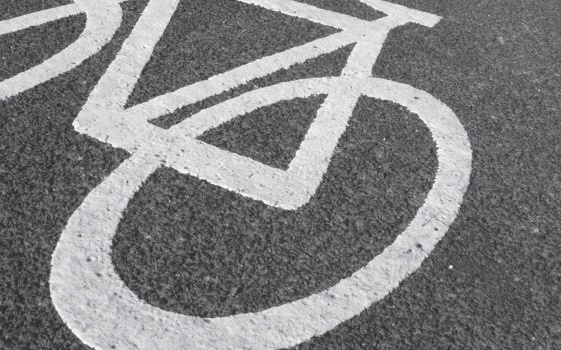 Asphalt bike paths and trails provide smooth, safe surfaces while managing fragile ecosystems. Asphalt pavement is also used worldwide as a practical solution to water storage, flood control, erosion, and conservation problems. Asphalt has been approved by the Environmental Protection Agency and used successfully as a primary liner for both sanitary and hazardous-waste landfills. It is also used to line drinking water reservoirs and fish hatcheries in California and Washington. Keeping it safe -- Smooth asphalt roads give vehicle tires superior contact with the road. One type of asphalt surface, known as open-graded friction course, allows rainwater to drain through the surface layer and off to the sides, reducing the amount of splash and spray kicked up by vehicles. These surfaces have been shown to greatly reduce crashes and fatalities. Reducing Noise -- Asphalt is the quiet pavement. Quiet pavement technologies include open-graded surfaces, fine-graded surfaces, and two-layer open-graded pavements. Noise reductions of 3 to 10 decibels are common. Reducing noise by 3 decibels is about the same as doubling the distance from the road to the listener, or reducing traffic volume by 50 percent. Better Water Quality – Managing stormwater is a significant issue in land use planning and development. Porous asphalt pavements allow for land development plans that are more thoughtful, harmonious with natural processes and sustainable. These pavements conserve water reduce runoff, promote infiltration which cleanses stormwater, replenish aquifers, and protect streams. 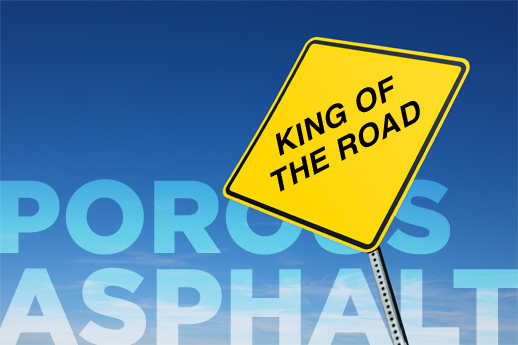 Sustainability Benefits – Asphalt pavements are America’s most recycled product. About 100 million tons of asphalt pavement material is reclaimed each year, and over 95 percent of that total is reused or recycled back into new asphalt pavements. One of the materials most dynamic features is that the asphalt cement can be rejuvenated and the aggregates reclaimed decreasing the demand on virgin materials. It is estimated that recycling of asphalt pavements saves the American taxpayer $1.8 billion per year. It also saves hundred of acres of landfill space each year. Materials from other industries are routinely recycled into asphalt pavements instead of going into landfills. Some of the most common are rubber from used tires, glass, asphalt roofing shingles, and blast furnace slag. Today’s asphalt pavements can be designed as Perpetual Pavements meaning the structure remains intact indefinitely while the top layer requires periodic removal and replacement. Providing a world-class transportation sector will require the nation to balance the challenges posed by increased congestion with the need to maintain a public infrastructure valued at more than $2.4 trillion. Livable communities have a broad appeal, especially in America’s more densely populated areas, but a well-connected highway system, maintained in good condition, is critical to the entire nation’s economy. It is important to stay focused on the huge stock of infrastructure already in place.